100% Jersey Tomatoes! All Natural, No added sugar, lower salt. 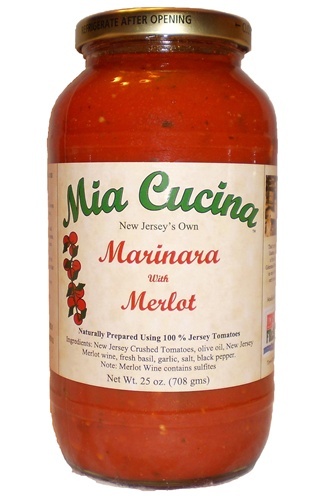 Jonhny C's other favorite Marinara sauce. We've taken our Mia Cucina Marinara Sauce made with World Famous Jersey Tomatoes and added just the right touch of a New Jersey Merlot Wine. The result is delicioso! This is a great sauce to add meatballs and sausage to. The additon of the Merlot wine just makes your taste buds sing! We bought this sauce to try as a test on our home made pizza that we do every week with friends and this sauce won. So next week at the farmers market where I bought my jar I will have to buy some more. It was a huge hit, I have to say good buy to my other store sauce.